Discussion in ''Personal' Software Reviews' started by BC2Tweak, Jun 21, 2016. We will be presenting to you, today, a review on a great little program call: GetDiz. It is produced by: Outertech (http://www.outertech.com), which produces such software as: Cacheman, Linkman, Clipboard History, etc. You can download it directly off the product page, listed above. It is less than a 2MB download, so it is a very, very small file. Now, let's take a closer look at "GetDiz". 1. The installation process is really simple. We will show you through the installation process by providing step-by-step screenshots. a. Locate where you have downloaded the "GetDiz" installation file. b. Then once you have located the above file, mouse-click on it twice, to start the installation process. c. Then, this Dialog Pop-Up Box will appear on your PC's screen. d. Then, once you have mouse-clicked "Next", you will see this Dialog Pop-Up Box. e. Then, once you have mouse-clicked "I Agree" to the legalese (Please do mean it, because within the legalese is important information for you to consider), you will be presented with this Dialog Pop-Up Box. 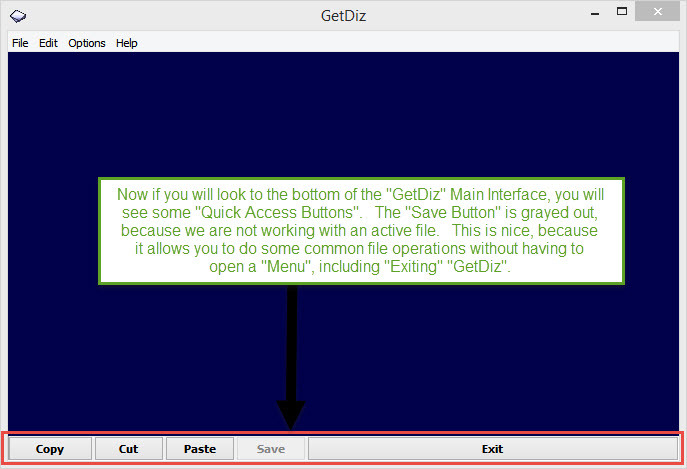 -- This is the screen where you choose what you want to install with the "GetDiz" program. --- The First Option is to allow installation to a USB Stick, which would turn GetDiz into a portable app. You can select this option, as it is not selected by Default. --- The Second Option is install the "GetDiz" fonts, which is selected by Default. I would recommend leaving that option selected. --- The Third through Fifth Options are File Association Options. I would recommend de-selecting the Third Option: "Associate with .txt files". I would also recommend leaving the Fourth and Fifth Options selected: "Associate with .diz files" and "Associate with .nfo files". --- The Sixth Option is also an File Association Option. I would recommend de-selecting the Sixth Option: "Associate with .ini files". 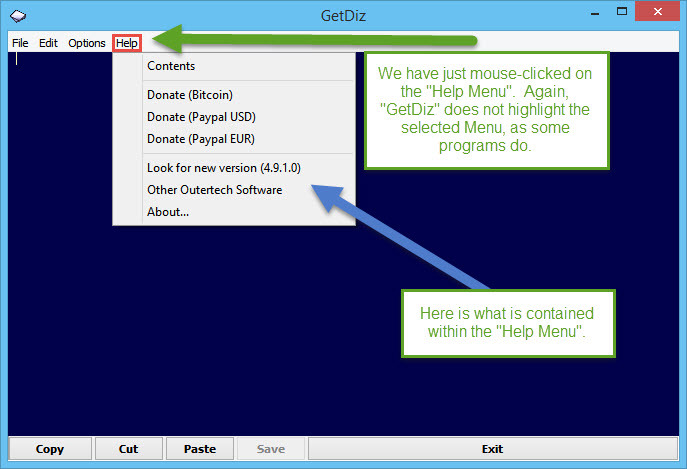 --- The Seventh Option: "Adds 'GetDiz' to "Send to' menu", is what you would prefer. I would recommend leaving this Option selected. --- The Eighth Option: "BitsDuJour URL", I would recommend de-selecting. It is an unnecessary URL shortcut that will be placed on your desktop. --- The Ninth Option: "Start Menu and Desktop Shortcuts", I would recommend leaving selected. f. Then, once you have selected all the Options that you want installed with "GetDiz", then mouse-click on the "Next" Button, at the bottom right of the Dialog Pop-Up Box, to be taken to the next Installation Screen. g. Once you have mouse-clicked "Next", as indicated above, then you will see the Install Location Dialog Pop-Up Box. h. Once you have mouse-clicked "Install", as indicated above, the Installation Process with finish by placing "GetDiz" onto your PC and installing all the Options that you selected previously. i. Once the Install Process is completed, you should see this Dialog Pop-Up Box. I would recommend de-selecting the "Launch GetDiz" Option, as "GetDiz" can now be executed at any time. 2. We will now look into how the program works. a. First of all, here's what the "GetDiz" Desktop Icon looks. Here's a tip for you that I've done for years: If you want to keep track of the version of the software that you are using, simple add its version # into the shortcut icon. b. "GetDiz" has a simple, but power "Menu". Here's what the "Main Program Interface" looks like, including the "Menu Bar", and the bottom "Quick Access Buttons". c. Here's a screenshot of just the "Menu Bar". d. Now, let's take a look at the "File Menu". 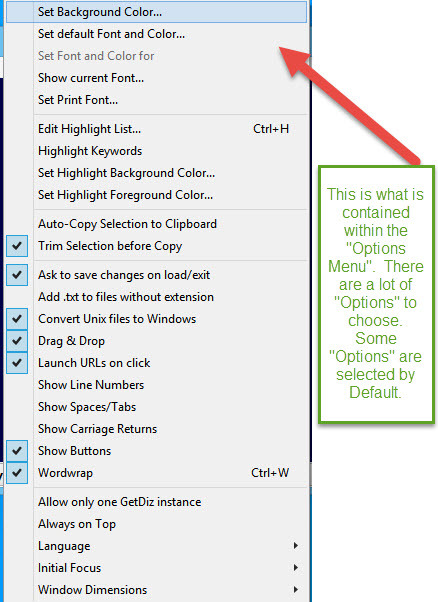 e. Now, let's take a look at the "Edit Menu". f. Now, let's take a look at the "Options Menu". -- Here's Part 2, which is the contents of the "Options Menu". g. Now, let's take a look at the "Help Menu". h. And finally, let's take a look at the "Quick Access Buttons", at the bottom of the "Main Program Interface". jasonX, guardian and artoor like this. your work never ceases to amaze me..
jasonX, BC2Tweak and artoor like this. your work never ceases to amaze me. jasonX and guardian like this. Very NICE BC2Tweak and fast, I remember that you just mentioned that last Tuesday I think...and now it's finished! Thanks for this review!